By Alan Davies - posted Wednesday, 6 February 2019 Sign Up for free e-mail updates! The recently updated passenger travel database for capital cities maintained by the Bureau of Transport Economics (BITRE) provides an historical account of how the share of each transport mode in Australia's capital cities changed over the 40-year period from 1976-77 to 2016-17 (see exhibit). Mode share is the best way of assessing the current state of play because it takes account of growth in population and in each mode. It's blindingly obvious from the exhibit that private modes (the great bulk of it cars) dominated urban passenger travel over the last 40 years. Moreover, there's little to suggest that's changing in any substantial way in favour of public transport. There's really no way this can be spun as a positive outcome or a promising prospect. While the demand for public transport in recent years grew in percentage terms as strongly as that for travel by car, it was from a much smaller base. Car travel in the capitals increased by 20.1 billion passenger kms over the seven years to 2016-17, whereas public transport travel increased by 2.1 billion passenger kms. The sustained dominance of car travel is despite the real price of petrol rising over the period and, more recently, rising complaints about traffic congestion. It's also despite significant increases in residential density in all the capitals. For example, Sydney's average weighted population density rose from 25 persons per hectare in 1991 to 30 persons per hectare in 2012 i.e. by 20% (see Are Australian cities sprawling at ever lower densities and Managing excessive car use; what's the low hanging fruit?). It's also despite improvements in public transport. For example, new electrified rail lines built in Sydney over the period include the Eastern Suburbs railway (1979), East Hills-Glenfield line (1987), Sydney Airport and Wolli Creek line (2000), Epping to Chatswood railway line (2009) and the South West Rail Link (2015). A light rail line was also constructed between the CBD and Dulwich Hill. In Melbourne, the number of AM peak train services increased by 32% between 2004 and 2015 and the train fleet expanded from 151 to 211 between 1999 and 2015. Since 1995, the metropolitan electrified network was extended to Cranbourne, Watergardens, Craigieburn, South Morang and Sunbury (see What's made public transport better?). 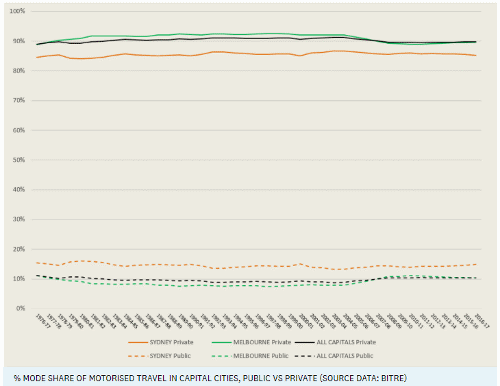 Train patronage certainly increased in both cities, but the impact on total public transport mode share was modest. Since 2010-11, public transport travel in Sydney increased by 1.5 billion kms, but private vehicle passenger travel increased by 5.3 billion kms. The comparable figures for Melbourne are 0.31 and 6.5 billion kms respectively. The mode share of private vehicles hasn't increased either, notwithstanding the construction of new motorways. For example, new roads built in Sydney over the period include the Warringah Freeway, Gore Hill Freeway, Sydney Harbour Tunnel, Eastern Distributor, Lane Cover Tunnel, Cross City Tunnel, Hills Motorway, Western Motorway, South West Motorway, East Motorway and Westlink. We don't know, though, whether the increase in passenger capacity of these roads exceeded that of the new rail lines. Under current policy settings, cars aren't going to go away any time soon or, for that matter, in the foreseeable future. Indeed, the pace of improvement in autonomous vehicle technology suggests cars will get more competitive in the longer term, while the shift to renewable power generation will reduce their environmental impact. Politicians like to make out that building more public transport infrastructure will solve all transport problems, but it's unrealistic to think serious mode shift can be generated just by building more train and light rail lines. For example, even if we take at face value the Victorian government's politically motivated claim that the Melbourne suburban rail loop promised at last November's election will shift 200,000 passengers p.a. from cars by 2050, that represents less than one percentage point of mode shift at a cost of $50 billion. Take away the politics and it's likely to be much less. The Melbourne Metro rail project will provide capacity for an extra 39,000 passengers in the peak; pretty modest considering there are 8.5 million private vehicle trips per day in Melbourne (see Will building more public transport seriously suppress car use?). Then there's the issue of cost. Melbourne Metro is estimated to cost $11 billion (nominal) for 9 km of tunnels and five new stations. The Melbourne suburban rail loop promised at the last election is estimated to cost $50 billion for 90 km of tracks and 15 stations. Finding funding for infrastructure on the scale necessary to significantly change mode share would be a huge challenge. Let me emphasise that we must build more public transport in our cities to meet the absolute growth in patronage. We should recognise, though, that past, present and promised improvements like the Melbourne Metro and the promised suburban rail loop won't have much effect on mode shift. They'll mostly benefit those travellers who choose to use, or must use, public transport i.e. mostly city-centre workers and students. However policy-makers should back away from framing public transport as primarily a substitute for driving. They should recognise that the urban population's long-standing and evident preference for on-demand point-to-point travel shows no sign of waning. They should acknowledge Australia's particular urban history; the benefits that capital city residents see in private travel can't be wished away ("How Ya Gonna Keep 'em Down on the Farm After They've Seen Paree?"). They should instead give greater attention to making point-to-point travel more efficient and less socially costly. That means requiring private vehicles to be significantly cleaner, smaller, slower, safer, quieter and more considerate of other users of the city than has been the case to date. The demand for road space must be moderated by more efficient pricing; we don't leave other scarce resources unpriced (including public transport! ), so it's ridiculous that we don't price driving efficiently. All of these actions can be implemented by regulation with vastly lower capital costs than current policies require. In the longer run, advances in autonomous vehicle technology might offer ways to use road space more efficiently, especially for the three quarters of all trips that aren't for work purposes. In the immediate future, though, technological improvements in small footprint vehicles like slow two-wheelers (electric bicycles/scooters) offer a promising way to provide most of the benefits of on-demand point-to-travel while minimising downsides like pollution and congestion. The key to boosting take-up of small-footprint vehicles is to provide a safe network of segregated routes that, relative to driving, provides substantially faster, more convenient (easier parking! ), and less expensive travel. Such a network would necessarily require taking road space away from cars as well as constructing purpose-built infrastructure, but the substantial social benefits should handsomely exceed the costs. The key challenge for policy-makers isn't to eliminate the evident desire for on-demand point-to-point travel. Rather, it's to "tame" the car, find better ways of providing flexible travel, and improve public transport, especially mass transit servicing locations of concentrated activity.